The Science and STEM department at SJCOE along with Core Partners from University of the Pacific, LLNL, Escalon, Lincoln, Manteca, Ripon, Stockton and Tracy Unified School Districts participated in a 3-year grant project that concluded in June of 2017. 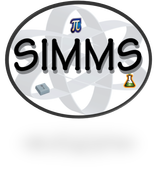 The Secondary Integration of Modeling in Mathematics and Science or SIMMS Project focused on the integration of modeling in math and science for grades 9-12. Lawrence Livermore National Laboratory (LLNL), piloted a program on modeling utilizing ﻿NetLogo.﻿ The Common Core State Standards in Mathematics (CCSS-M) and Next Generation Science Standards (NGSS) require students to either use models or develop their own. This grant trained 58 teachers on how to use and train other teachers to use computational modeling in their classes. This 3-year grant starting during the summer of 2014 with a week-long intensive and continued though the 2016-2017 school year. Teachers also participated in two rounds of follow-up training in the form of lesson study. The purpose of the lesson studies are to develop integrated math and science lessons with NetLogo models/simulations using the 5E lesson plan format. ​Tracy High Student's video tutorial on using NetLogo! ​during our summer intensive training! NetLogo, authored by Uri Wilensky and developed at the CCL, is a multi-agent programmable modeling environment. It is used by tens of thousands of students, teachers and researchers worldwide. It also powers HuBNet participatory simulations NetLogo can be downloaded for free by visiting http://ccl.northwestern.edu/netlogo/. NetLogo is now also offered in a Web version that runs entirely in a browser.